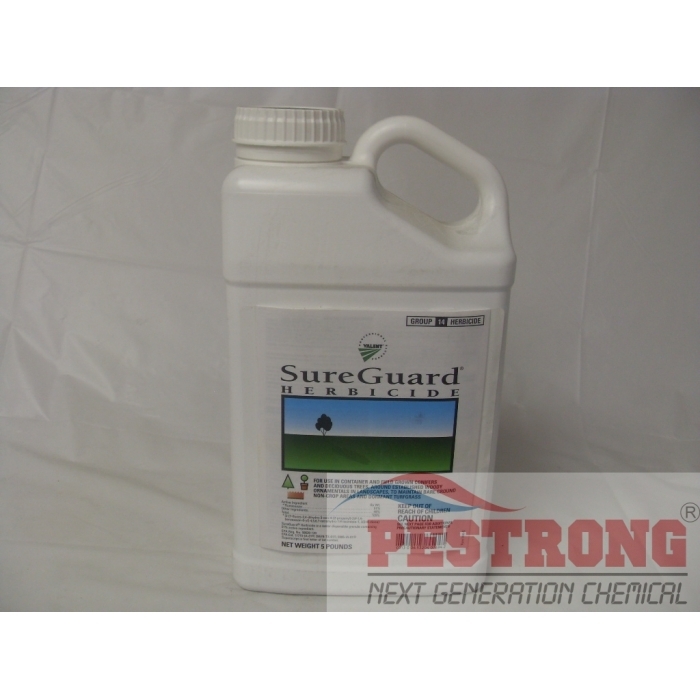 Where to Buy SureGuard Herbicide, SureGuard Herbicide Non Selective - 1 - 5 Lb - $177.95 for Sale with Fast Free Shipping! SureGuard Herbicide Non Selective - 1 - 5 Lb is longest residual sprayable non-selective herbicide in the market. If your herbicide keeps causing callbacks, you should switch and treat your customers' trees and shrubs with the longest residual on the market in SureGuard Herbicide. Use SureGuard Herbicide to provide outstanding weed free trees and shrubs in your customers' ornamental beds. It won't stain, and it provides excellent, long-lasting preemergence control of tough annual broadleaf and grassy weeds such as spurge, bittercress, oxalis, common groundsel and crabgrass. SureGuard also enhances knockdown performance of glyphosate when used as a tank mix partner, even on glyphosate-resistant weeds. Long-lasting SureGuard provides an exceptional value that allows you to offer more and make more—a perfect solution for your highest value customers. SureGuard is now registered for use on dormant Bermudagrass! SureGuard provides effective, fast-acting postemergence and season-long preemergence control of Poa annua as well as preemergence control of goosegrass, crabgrass and other summer annual weeds. We recommend mix with glyphosate and methylated seed oil as surfactant for best result. I have been using Sureguard for the past 2 months and have been very happy with the results. Sedge hasn't been much of an issue for me in beds. I have 2 small sections that need to be controlled every year but i just hand pull as it isn't much. It works. After 4 months, still no weed out over my yard. I used this last year with glyphosate. It works like charm as described with long-lasting. I recommend this every winter season for prevent poa problem.